Be on the look out for a powder-headed Nancy spouting equations. What did Leibniz steal ? He was remarkably original. Leibniz, as far as I know, developed the only platonistic physics,another term for top-down casusation, or mental causation. This was the basis of his totally original philosophy. Later Einstein adopted his view that space existed only as geometric relations between nearby objects. Dr. Roger B Clough NIST (retired, 2000). This was supposed to be a humorous post. At the time I posted it I was working on a project for University of Pittsburgh’s Archive of Scientific Philosophy, with a professor of mine, Dr. Nicholas Rescher. He discovered the plans for Leibniz’s Cipher machine. This was the first actual cipher device, but no one was interested so it was never built. It’s ability to create complex codes was not recreated until the German ENIGMA. I’ve attached links to this amazing little machine below. 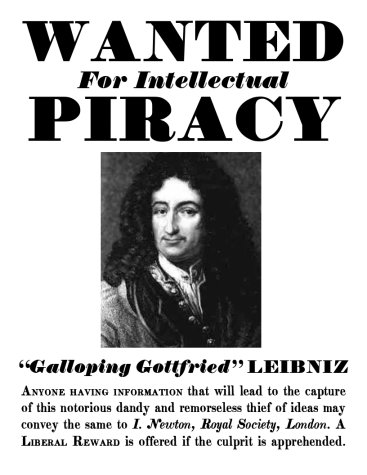 Anyway, I was reading up on Leibniz at this time and found the wanted poster. As an individual educated on Leibniz you should well know of the Leibniz-Newton controversy concerning the “invention” of calculus. Both seemingly worked out calculus simultaneously. Newton started his work before Leibniz, but Leibniz published his findings first. Newton blamed Leibniz of intellectual theft. The rest is history. Today both are credited with the find. But it does make me feel a little better that the notations we use for calculus are Leibniz’s. Don’t forget that Leibniz also invented the binary system that our computer’s use! Rescher wrote a fine book on Leibniz. I have a copy. And Leibniz was a master in many fields. It would be interesting if the Germans (nazies) who invented the enigma cipher machine, based on a leibniz idea.